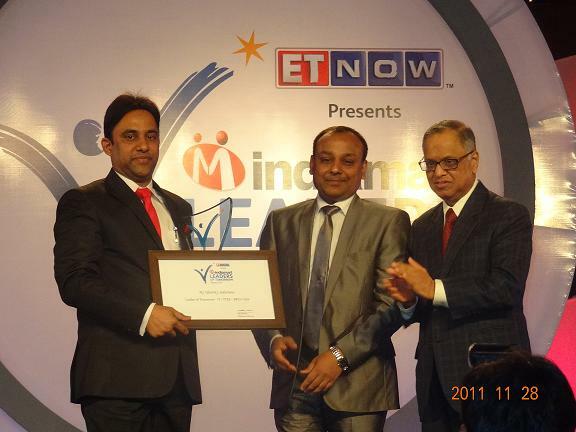 An able thought leader and a successful architect of Identity innovation, Dr. Sreeni Tripuraneni, Chairman & CEO of 4G Identity Solutions has received the prestigious Indiamart ET Now ‘Leaders of Tomorrow’ Award 2011, at an award function held at Mumbai, India on 28th November 2011. The award was presented by the chief guest Legendary N.R. Narayana Murthy, Chairman Emeritus, Infosys Technologies. ‘Leaders of Tomorrow’ salutes the spirit of entrepreneurship and celebrates the success of India’s best Small and Medium Enterprises. This award will inspire future leaders to tread a path of success and triumph. The award will celebrate the success stories and honor entrepreneurs who have transformed stumbling blocks into stepping stones driven by their passion,Determination and undying spirit of entrepreneurship. More than 50,000 nominations have been received across 13 different categories for the Leaders of Tomorrow Award 2011 and after thorough review of the nominations by the process experts Ernst & Young around 70 companies per category have been shortlisted, which were invited for the preliminary jury round. After the preliminary jury round, 5 companies per each category have been invited for the final jury round. The award is decided by a diverse panel of independent, impartial jury from various backgrounds to execute the judging process headed by Mr. Sam Pitroda, Advisor to the Prime Minister of India on Public Information Infrastructure and Innovations. 4G Identity Solutions has emerged a winner in IT/ITES-BPO/VAS category for its pioneering vision, strong financials and the state of the art solutions and its impeccable project delivery. 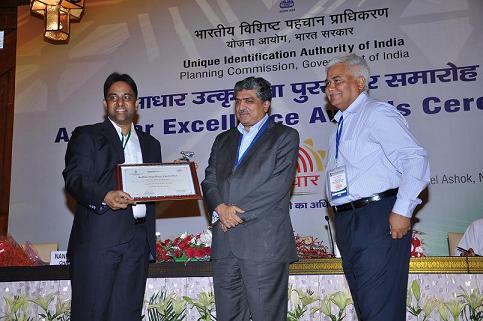 4G Identity Solutions has also won “Aadhaar Excellence Award” from Unique Identification Authority of India (UIDAI) in Enrolment Agency category for its excellent efforts in Aadhaar Enrolment services. Dr. Sreeni Tripuraneni received the Aadhaar Excellence Award from Mr. Nandan Nilekani – Chairman, UIDAI on 29th September 2011 on the occasion of 1st year anniversary of Aadhaar project launch. 4G Identity Solutions (4G) is a leader in providing end-to-end National Scale Citizen ID Solutions, Large Commercial ID Management Solutions, Law Enforcement Solutions, Enterprise Identity and Access Management Solutions, Biometric Enrollment, Authentication and Verification Services and Public Service Delivery Infrastructure. 4G Multi Modal Identity Platform integrates best-of-breed Iris, Fingerprint & Facial technologies and offers low cost, interoperable, secure, and scalable Identity solutions. 4G has to its credit deployed the world’s largest ID management solutions including India’s 1.2 billion Unique ID Project.